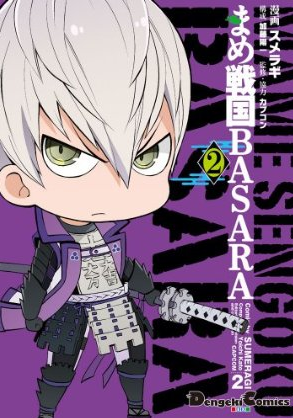 Following straight on from where the first volume left off is the 126-page Mame Sengoku Basara 2 ('Bean Sengoku Basara 2'). This collection of the next ten chapters of Sumeragi's comical manga was released by ASCII Media Works back on 27th October 2012, priced at ¥780. It can be purchased from all good import book stores such as Yesasia, Amazon Japan or CD Japan. The ongoing plot about the Battle of Sekigahara takes a back seat in this volume as the focus drifts around Japan, with chapters devoted to seasonal staples such as hanami parties and the rainy season. We finally get to see what Mitsunari's western army has been up to as he and Yukimura go on several adventures together this time around, including a whole chapter devoted to their trip to meet Shimazu Yoshihiro. With the series now up to twenty chapters in total, a few running gags have crept into the script like Ieyasu annoying his allies by spontaneously appearing and asking to stay at their castle. These moments poke fun at the characters' eccentric personalities, making the comedy much more charming. It's not all completely light-hearted, however. In one story, Mame Sengoku Basara explains how the opening cinematic from Sengoku Basara 3 Utage might have happened - it turns out that Keiji arranged the whole thing to help Tsuruhime's sick friend Nagi enjoy a festival for the first time. Later, in another chapter, there's a glimpse of how Ieyasu and Mitsunari both served together under Toyotomi Hideyoshi. Mitsunari's dismissiveness towards Ieyasu is funny to watch, especially when he's desperately trying to please Hanbee at the same time. Sumeragi's impossibly-cute adaptation of the Sengoku Basara series shows no sign of losing its spark with this volume and I look forward to reviewing the next one as soon as possible. If I were to voice one very minor complaint it would be that a few characters such as Yoshiaki haven't had a proper chance to appear yet - I'd like to see him star in a story of his own soon to make up for his absence. Flashbacks to a time when Nobunaga's forces were still alive would also be greatly appreciated. Given how many characters there are in the game series, there's definitely plenty of mileage left in the Mame Sengoku Basara formula. May it continue running for many years to come.